Nagasa 48 tooth Thinning Shears Rainbow Titanium. These are the Nagasa 7.0″ 48 tooth Rainbow Titanium Thinning Scissors. These Pet grooming shears Feature an offset grip for extended comfort and the easy click leaf spring adjustment knob for quick and convenient scissors adjusting. These Nagasa 48 tooth Thinning Shears Rainbow Titanium dog grooming scissors are ideal for the professional pet groomer who works with Dogs & Cats. 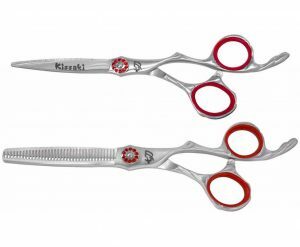 All Kissaki Dog Grooming Scissors are Lifetime Guaranteed and come with our beautiful custom shears case including lubricant, finger sizing ring inserts and a leather cleaning – polishing cloth.